WHEREAS, it is in the best interests of both the City of Goodland and entities receiving aid to provide clarity of its compensation expectations when mutual aid is rendered. That the one-page supplemental document entitled Mutual Aid Compensation Policy for City of Goodland Utilities” and included with this Resolution is hereby adopted and incorporated. That this policy be provided to both City employees deploying on a KSMAP Agreement and to entities receiving aid from the City through the KSMAP Agreement. The entity receiving aid will reimburse the City of Goodland for all labor and equipment costs expended as a result of any Mutual Aid Request. No employee deployed on a KSMAP Agreement shall work more than sixteen (16) hours per day. Employee time spent on “standby” and time spent travelling to and from location will be considered time worked. Employees deployed on a KSMAP agreement will be guaranteed compensation for a minimum of eight (8) hours of work per day. 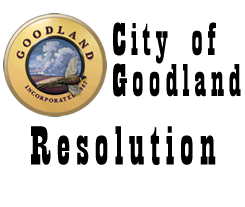 The entity receiving aid will compensate the City of Goodland this minimum amount even if the employee’s actual hours worked is less than eight (8). Employees deployed on a KSMAP Agreement will be paid their standard wage rate for the first eight (8) hours worked per day and will be paid at the overtime rate of one-and-one-half (1.5) times the employee’s regular rate of pay for all hours thereafter.